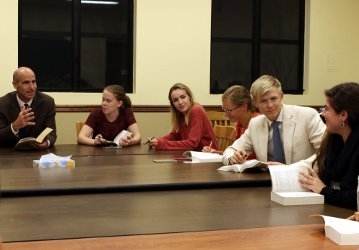 In recent months, Thomas Aquinas College has earned a top spot on numerous college-ranking lists, including Best Colleges (U.S. News), Best Classroom Experience (Princeton Review), “Best Roman Catholic Colleges” (USA Today), and Underrated Colleges Doing Great Things (College Factual). Yet there is one list on which Thomas Aquinas College is nowhere to be found: The 25 Colleges that Make the Most Money from Students’ Application Fees (Insider). Whereas some colleges charge students as much as $150 for the privilege of filling out an application, Thomas Aquinas College does not charge its applicants at all — nor has it ever. Moreover, the College’s practice of not charging applicants is in keeping with its longstanding policy of not turning students away on the basis of financial need. “We would never want an application fee to keep a willing and able student from pursuing this program,” says Mr. Daly. And that commitment is why the College routinely finds itself on other notable lists, such as Top 10 Colleges for Financial Aid (CNBC), Financial Aid Honor Roll (Princeton Review), and Best Values in Private Colleges (Kiplinger).